From ghost doggo to city developer, there’s a wide selection of games in this week’s free games. For my ‘Free Game of the Week’ I would love to highlight a charming Pico-8 cartridge named Pixeltown which was developed by one of my favorite PDX game designers: Nextlevelbanana! This is a great idea for a game, where you can choose from several different tiles made of trees, houses, roads, chickens, and more, to create a little prototype town or city. I loved this because it reminded me of a cuter, more pixelated version of the world builder in Legend of Mana! I love this mechanic… there’s so much joy in being able to use the same building blocks to make unlimited different potential storytelling outcomes! Pixeltown is a really great, fun experience, and also a fun jumping off point for creativity. Check out this super-awesome, character-filled release on Itch.io today! As a 4-year veteran of Clash of Clans, it’s fair to say that I quite like Supercell and the games that they create. Over the years I’ve tried all of them, but nothing held my interest other than Clash… until now. Brawl Stars is the latest game from the studio and is available on iOS and Android. 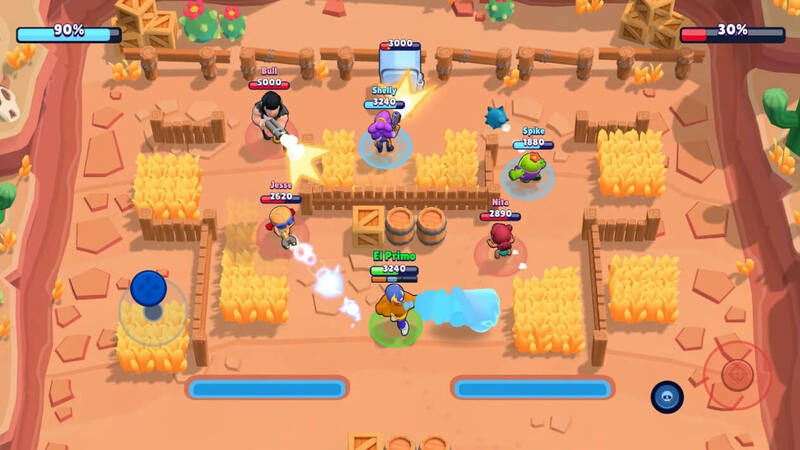 Brawl Stars is a multi-player, twin-stick shooter that puts you on a team of (usually) 3 players, and matches you up against another team of (usually) 3. There are a variety of different game modes to choose from, and a plethora of characters (known as brawlers) to acquire, either from loot boxes or via a trophy progression system. This system also unlocks additional game modes, loot, gems, tickets to timed events, upgrade points for your brawlers and more. Once a brawler has enough upgrade points you can spend coins to get them to their next level, which increases damage and hit points. All of the brawlers have strengths and weaknesses: there are very tough, hard hitting, but very short range characters; and there are long range, very accurate, but very squishy ones too! Selecting the best brawler for each chosen gamemode and map becomes quite strategic. You acquire loot boxes by spending tokens collected when you win a match, rank-up a brawler, or level up yourself. The amount of available tokens from winning is time limited, meaning that you can’t just blitz through the game and unlock everything straight away! Another neat mechanic is the rotation of the maps — basically each game mode has a map available for a limited time. Once that time is up, another map becomes playable. There are stars to be collected for winning a match on a map as it becomes available, which in turn are used to unlock bigger loot boxes! This means that you are constantly selecting different maps, modes, and brawlers at all times, in order to best collect all of the stars, trophies, rank points, tokens and experience that are on offer — all of which means that the game is constantly changing and you don’t have time to get bored! And if all that wasn’t enough, you can join other players in a club, or connect to Facebook to find your friends. Once you know some people, you can party with them to play a match by simply adding them from the home screen. The whole thing is really easy and promotes strategic play by enabling a party-wide private chat, in which you can discuss tactics etc. All in all Brawl Stars is an extremely polished, balanced, fun game and totally worthy of the (already) many hours I have spent playing it! You can grab Brawl Stars on iOS and Android. The Mortal Kombat Project is a fan project made in the free fighting game engine M.U.G.E.N. It has been in development for years, and has recently released its latest version. The project aims to collate all the fighters from the Mortal Kombat games into one game, with a view to delivering a MK3/Trilogy style of game, but one which encompasses all the fighters from the 2D games, some 2D recreations of later 3D characters, and other variants (like a robot Sub Zero in the vein of Sektor/Cyrax). Gameplay is much as you would expect from MK3, but includes other elements — such as the Aggressor Bar from the Trilogy game. Other game modes enable you to have twoon–two battles. But get this, all four can fight at the same time. Four fighters on screen at once… It can get a bit manic at times to say the least. All the moves from previous games are there, including the combos from MK3, Fatalities from all the games, even friendships and other moves for characters that previously did not have them. This is not just a collection of MK characters just bundled together, there is a lot of custom elements in the game; A ton of new stages are included, new audio and sound effects too. It’s a wonderful little collection that is well worth a look. I mean, come on. It’s the best of all the 2D Kontent in one place, plus more. Being that it’s also in a fully customisable engine, through the link you will find a few downloads for extras that you can add into the game. Downloads which allow you to restore original sounds, alternate between life bars, and even one for an expanded character select screen to add more characters. Yes, you can do this. And there are hundreds, if not thousands, of characters you can download. Want Scorpion to face off against Peter Griffin? You got it. Or, maybe make your own Street Fighter VS Mortal Kombat game! You can download Mortal Kombat Project. A sole messenger with a simple task: deliver a message to the king of a neighboring area. However all is not as it seems as goblins stalk the roads and the dead are restless. A Messenger’s Tale is a short adventure made in Pico8 which features a light RPG system and timing based combat. There’s always something fun and familiar about sprite-based RPGS. They remind me of cruising through shareware and abandonware disks and folders in my youth, desperately seeking out something with a little bit of extra character and substance among the pulp. A Messenger’s Tale manages to hold its head aloft from the others by having a very fun, if tough to master, combat system based around timing. Each combat instance, from goblin through undead king to goblin king revolves around hitting a key as an indicator crosses into a coloured part of the bar. If you are too quick, too slow, or simply miss, then you miss your hit and the opponent get to take their swing at you. Defending, like attacking, relies on this slider, and so — if you have adequate reflexes — you can get through fights without taking any hits if you are adept. I do wish that there was a bit more equipment, a few more screens, and maybe some difficulty modes which adapt the size of the hit-area, but even without those modifications A Messenger’s Tale is a fun game to play for five-ten minutes assuming you have the reflexes. When a pet dies the whole family is affected. Itis as if they lost a family member, but there isn’t much that can be done. In Goodbye, Doggy, a game made for the Global Game Jam, you play the ghost of a dog who can’t leave Earth without helping his family cheer up. Everyone is grieving in their own way — and some of the members of the family aren’t even really taking care of themselves properly. As a ghost dog, you can fly through walls, exploring rooms, and picking up objects to bring to your human family. You can also bark, although no one really hears you. You’ll need to listen to what each family member needs and try to help them accomplish it. Once they are their happier selves, you can finally go to rest. Goodbye, Doggy is a sad yet heartwarming game well worth playing.